Management of position, posture and weight distribution are key elements to skiing. In the “pattern”, our weight is over the right leg driven in part by a dominate right antero-lateral abdominal wall. This works in our favor with a left turn. The pelvis is oriented to the right, we have Right AFIR, right shoulder is down with left trunk rotation and a right arm forward. Weight distribution over the right ski, or downhill ski, in a left turn is pretty important especially with the ability to adduct and internally rotate on the right. The inside portion of the ski, or the inside edge, is necessary so that we don’t slide or fall straight down the hill. This is called edge control and the ability to evert the downhill ski while we invert the uphill ski gives us direction and control. This is also called a parallel turn. The ankles in a ski boot are fixed and move very little so frontal plane control has got to come from the hips and knees. 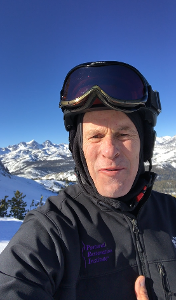 But the feet and ankles have an important role with sensing the ground and signaling the brain and rest of the kinetic chain the position of the skis and helping to control shifting of weight side to side, forward and backwards. Tri-planer thinking starts with sagittal plane and having a neutral pelvis is necessary to transfer load from right to left side, left turn to right turn. Without sagittal plane control and maintaining it, frontal plane control will suffer since adducting a femur then internally rotating it will be limited at best. Without sagittal and frontal plane management, a ZOA on the left will also be compromised and limit the ability to turn a pelvis to the left to stay effectively in left stance with right trunk counter rotation. As a side note, this directional separation of pelvis and rib cage is another critical component to performance. Trying to teach someone to just “get better” at right turns without a tri-planer position awareness will be a limiting factor at best. Dominant neurologic patterns and natural human asymmetries drive every form of breathing, position and movement. The inability to manage patterns, asymmetries and breathing shows up in performance from simply walking to every sport or physical activity. Skiing is no exception and it is especially true with the ability to ski-turn to the right as well as to the left. Ask most skiers which turn is easier and invariably they will mention their left turn going downhill is easier that their right. Knowing the PRI definition of “AFIR” and “AFER” can help even the non-skier understand the mechanics and problems facing a skier attempting to get into left stance or Left AFIR as well as their right stance or Right AFIR. For most people in the “pattern” (Left AIC, Right BC), they get into Right AFIR more easily than their left. They can get so good at it that they are stuck in it. For some in what we refer to a PEC pattern, they really don’t do right or left stance very well but they tend towards right stance easier. The point is to do both well especially on the left and that means getting the socket over the ball (acetabulum over femur) as well as the femur turning internally in the socket (femur under socket). For an effective right turn, the pelvis has to orient from the right to the left for Left AFIR. Being able to position a left inominate bone from flexion towards extension into neutral is the job of the left hamstring and glute. Then having the ability to put that ball joint into the socket depends on an anterior lateral abdominal wall, an anterior glute medius and a distal left adductor that has an internal rotation component to it. None of this will happen without getting a hemi-diaphragm to “dome” or create a “Zone of Apposition” (ZOA) and help to inhibit a left psoas muscle that contributes to the inability to put the pelvis in a position so a femur can adduct. With sport performance, not only do both femurs need to be able to adduct in stance phase, but they need to be able to adduct with strength and power. Adduction of a femur is critical for a ski turn along with internal rotation of a femur driving the knee medially for frontal plane control of the “inside edge” of the ski, left and right side, but especially left since this is the side most of us have difficulty with. Many skiers are great compensators, like many athletes, and they find a way to have decent turns to the right even without the ability to adduct or get into Left AFIR fully. But this comes at a cost with extension of a spine and compensatory torque into a knee that often can lead to reliance of end ranges for stability. Skiing, like walking, requires that our brains sense the ground or in this case the snow under a ski. Getting into left stance is critical for this process proprioceptively so the brain can trust being on the left side for a right turn. Without the ability to get into Left AFIR, dominate patterns will prevail and most skiers will fight with a right turn to some degree regardless of their ability. 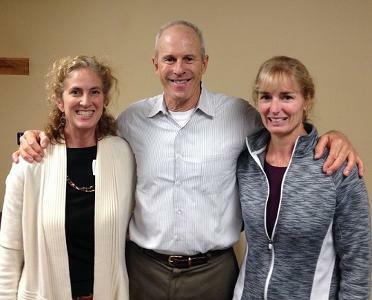 Hosts Joy Backstrum PT, PRC and Katie Piraino, PT made this weekend a most rewarding one to teach Postural Respiration. There was a lively discussion throughout the weekend with intelligent questions always on point supported with a curious attitude to understand the concepts and application of PRI principles. In addition to numerous P.T. 's there was an ATC, two CSCS strength professionals, a cranial/sacral therapist, one dentist and an optometrist! The dentist is most interested in sleep apnea, airway management and how PRI principles can be applied to her holistic approach to dentistry. Several attendees had been PRI patients and were hungry to learn more and share their personal experience of PRI with their patients. For several students this was their third primary course that connected the pelvis with the thorax and connecting the dots that femurs need to adduct and a thorax needs to flex with ribs that can internally rotate for reciprocal and alternating function. The topic of "separation" of a pelvis and thorax was explored as well as a discussion that not only to feet often need an orthotic, but the optometrist and dentist appreciated that eyes and a TMJ or the teeth need an orthotic as well. It was such an addition to have these two professionals and their enthusiasm. Thank you to The Physical Therapy Place for being such a great host site! Jen Poulin, one of PRI's veteran faculty members, told me that this group of attendees would be great to present to. She was spot on and this group assisted by Carolyn Weber, PT, PRC and Holly Spence, PT, PRC was most engaging and enthusiastic . There were physical therapists that either worked in a hospital setting, private practice or with local ski teams. 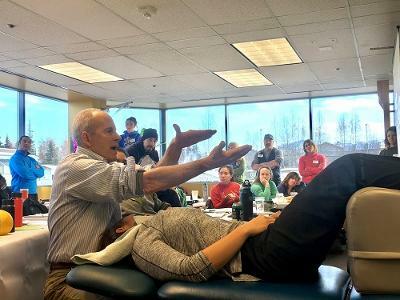 Former ski racers, now turned physical therapists and mentors that were new to PRI got the concepts immediately and could see applications for their athletes as well as general populations. As always, the questions asked were intelligent and challenging backed by a strong drive to learn and explore new concepts and practical applications of a previously unknown science to many in the room. Also in attendance was a DC/PT, athletic trainers and strength and conditioning professionals. Vermont has a great audience and already has another PRI course scheduled for next year. Many thanks to the staff at Northwestern including Karen Staniels and Christy Cushing. Thanks again to Carolyn and Holly for your help! Postural Respiration in Detroit, MI. Course in Review. 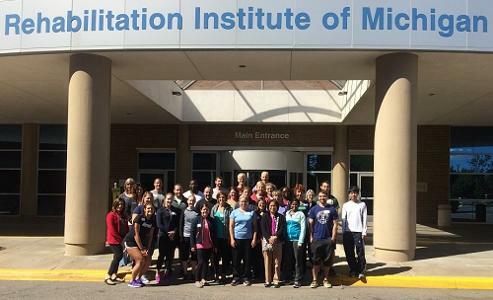 Postural Respiration was taught at the Detroit Medical Center in the Rehabilitation Institute of Michigan building September 10-11, 2016. 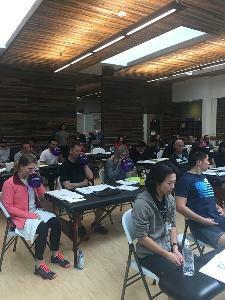 This course was 2/3 full of new students to PRI and many other first timers to Postural Respiration. This group was enthusiastic from the start and responded well to learning the basics of PRI from providing a foundation with a neutral pelvis then addressing ribcage management of tri-planer air flow. 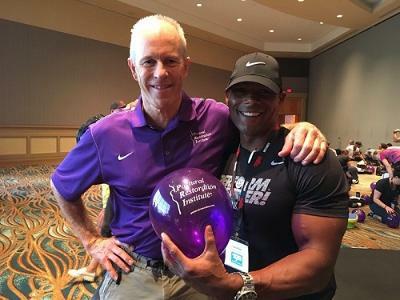 Some of the big hits for new time attendees were that the left hamstring is an essential muscle for pelvic repositioning and is necessary to achieve an agonistic relationship with a left abdominal wall. This basic but essential concept was a huge revelation to even the most seasoned practitioners attending. During lab the concept became very real as femurs started adducting after a non-manual repositioning technique. 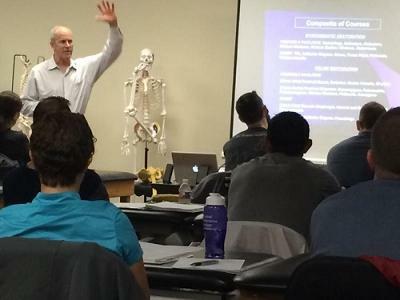 Of note was one of the PT's in the course had taken a Protonics course by Ron Hruska in 2000! During this course there was time to really correlate PRI testing with position of the diaphragm as it relates to the axial skeleton. Then being that this course has manual techniques, one and two person manual techniques were described and demonstrated numerous times with reasoning when and why a manual vs. non-manual technique would be used. Detroit is a great city and this was a great venue! The feedback was Michigan doesn't get enough PRI courses and they want more! Team sports chiropractor for the Seattle Seahawks, Dr. Jim Kurtz, provided his facility, NW Sports Rehab for Postural Respiration last weekend located in Federal Way, WA. It was a class with more than half new attendees to PRI and a great mix of PT’s, DC’s, ATC’s and strength and conditioning professionals. Increasingly there is an interdisciplinary mix of different professions which brings a variety of perspectives and energy! 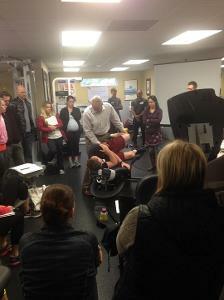 Kansas City Postural Respiration Course in Review - First PRI Course Taught by a Chiropractor! 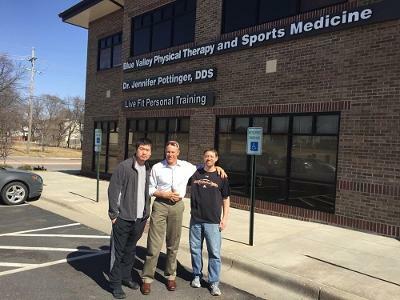 Leap year weekend outside Kansas City, KS sponsored by Blue Valley Physical Therapy was a big leap for me as I “soloed” to teach Postural Restoration on my own for the first time! The location and participants could not have been more interested and engaged! Physical therapists, chiropractors, athletic trainers, strength and conditioning experts, and two eager P.T. students from St. Mary’s locally and two eager chiropractic students from nearby Logan Chiropractic School were in attendance. The weekend was high energy and the feedback was extremely positive from attendees that were new to PRI and want to continue on as well as return attendees who are deepening their understanding of PRI principles! In addition, each P.T. and D.C. student came loaded with curiosity and intelligent questions!